Hi everyone. Thanks for tuning in last night, I hope you enjoyed the show! I’m having a few issues logging into Mixcloud at the moment so the show’s not available to stream just yet. I’m working on it though, so keep checking here for updates! 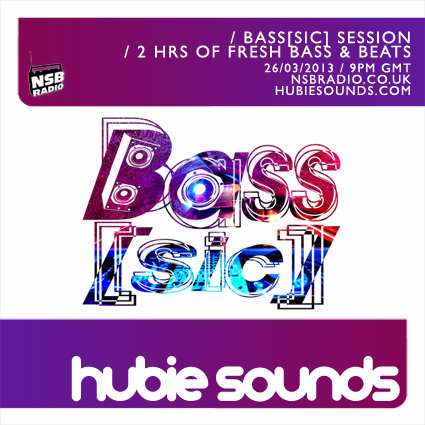 Make sure you tune into the next Hubie Sounds on Tuesday 9th April @ 9pm BST – live and direct on NSB Radio! Thanks for tuning into the show last night and helping us celebrate our 1st year anniversary on NSB Radio, we hope you enjoyed it. Thanks for downloading the show! Here’s to many more successful years on the station! Ah, it only seems like yesterday when we kicked off our first Hubie Sounds on NSB Radio with the excellent psychedelic vibes of Tomorrow Never Knows by The Beatles. However that was actually one year ago this month, so this Tuesday we will be presenting a special show to celebrate! Hubie will be spinning a selection of his favourite tunes played on Hubie Sounds over the last year, plus we will also be replaying the very popular guest mix from Peo de Pitte when he graced the studio earlier in 2010. We hope you can join us and help celebrate this grand occasion! Hubie Sounds – 1 Year On NSB Radio Special – Tuesday 23rd November @ 9pm UK time – live and direct on NSB Radio! I hope you’re all recovered and well rested from the debauchery of Breakspoll cos this week we are gonna be hitting you for six with another round of beats, breaks and basslines from the world of Hubie Sounds! We’ll also be spinning fresh new beats by the likes of Alex Metric, Elite Force, Peo de Pitte, Plaza de Funk and many more! Hubie Sounds this Tuesday 9th March @ 9pm UK time – live and direct on www.nsbradio.co.uk! It’s time for the second installment of Hubie Sounds Breakspoll 2010 Specials and this week we’ll be dedicating the whole show to wall-to-wall breakbeat classics of the past 12 months. That’s right, to get you nice and fluffed for the big event that’s taking place this Thursday night at Fabric in London, we’ll be spinning great tunes by the front runners of the breaks scene and some of the Breakspoll nominees – artists such at NAPT, Plump DJs, Stanton Warriors, Elite Force, Krafty Kuts, A-Skillz, Peo de Pitte, Eshericks and many more! We hope you can tune in to the Hubie Sounds Breakspoll Special Pt.2 this Tuesday 23rd February @ 9pm GMT – live and direct on www.nsbradio.co.uk! download HUBIE SOUNDS with special guest peo de pitte!